I grew up in a country where the term French Perfume was almost a brand on its own. “She wears French Perfume” or “He gave her French Perfume for her birthday” – without even a notion to specify a house or a brand. But then there weren’t that many perfume brands … I won’t even say available – present or widely known there at the time. French Perfume was in some respect a status symbol. Climat by Lancôme was one of a few procurable brands. In my childhood older women used to wear this perfume: not because it was considered older-age appropriate, but rather because the price and scarcity were more “younger-age prohibitive.” My grandmother went through several bottles and I kept getting empty ones from her to play with. When I was seven it became my first and everlasting fragrant love. 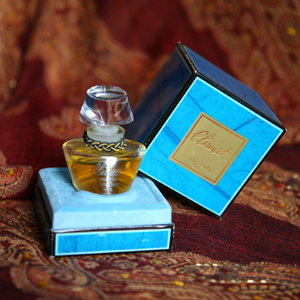 For many years Climat was my only luxurious, dressed-up, going-out, Big Evening Perfume. It was my signature scent – I just wasn’t familiar with the concept. I’ve gotten older, changed continents, mastered an online shopping and accumulated a slightly frightening (until recently mostly mainstream) fragrance collection. A couple of times I attempted buying my beloved fragrance online but every time something wasn’t exactly right: it was a reformulation, a different concentration, a fake or an old perfume that went bad. I gave up and succumbed to the idea of Climat being lost to me forever. Even though I smelled Climat first on my grandmother and she was the one who allowed me to use her perfume from time to time and then presented me with my very first personal 14 ml bottle of Climat Parfum, I’ve never associated it with her… until recently when I gave it to her on her 90-year birthday. She says it smells different from how she remembers it but she still likes it. For real reviews read: Muse in Wooden Shoes, Perfume Posse or Bois de Jasmin. This entry was posted in Favorite Perfumes, Not a Review and tagged Climat, Lancome. Bookmark the permalink. At some point I’ve decided to stop buying any perfumes from discounters: the disappointment from getting spoiled or fake fragrances easily beats any savings. So now I do online shopping only through trusted stores (well, trying to get some discount or deal, but in general not too far from the original price). I wish we all could smell the version of Climat that your grandmother remembers, the one from your childhood! Very sorry to hear about your experiences with online discounters. I have yet to move beyond samples online…something about not being able to see (and sniff) the bottle first keeps me from taking the plunge. My next step will be probably to stop buying perfumes on eBay as well: I’ve managed to get a refund a couple of times when the perfume was plainly wrong or completely spoiled but I’m afraid I’m running out of luck. So I should stick to buying in stores (that helps building relationships with SAs which brings up more samples I can get for free), from a couple of trusted online retailers (luckyscent, aedes and such) and doing some friendly splits. I’m several years late, I know, but thank you for the advice. I was on the fence about buying from ebay and discounters because I was afraid of those exact problems. Do you have a local shop you like supporting? I have one here in Vancouver BC, and the service makes up for the price difference. The shop owner is a delight. At this point I buy perfumes so rarely and from very different sources, so it wouldn’t make sense to try cultivating relationships with SAs in any stores – so mostly I buy online from brands’ sites, other reputable places (for niche perfumes) or duty free (for something like Chanel or Jo Malone). But if I were to go to a real store, I’d probably buy from our local Twistedlily Perfumery: they have a very nice selection of niche and indie perfumes. I think so too. Every time I wear it.